This year has seen an up and down year socially with some very successful nights and the unfortunate cancelling of the traditional xmas party…we will continue to put on the social functions in the coming years and continue to tweak and make changes as we move forward. The Trivia night was re-installed and was a great night run by Andrew “Banger” Bailey as Trivia Master with plenty of fun, throughout the night with paper plane making competitions, closest to the Jim Beam Bottle coin toss and several challenging rounds of trivia. The Reverse Raffle produced a great outcome for the club as the major fund raiser and what a great night we had. The fire pit and pool table went out onto the balcony and Cloud9 belted out some great 80’s and 90’s tunes whilst the countdown began. Congratulations to Akila for his win !! Thursday nights saw the cooking of meals by players continue and every Saturday we had food at the bar for the after game… This year we introduced the Table Tennis championships….it was the longest championship ever run but after the preliminary rounds, we saw the favorite, Ed “Squidward” James choke in the grand final after being completely picked apart by the 1st XI captain, Andrew Lammardo. 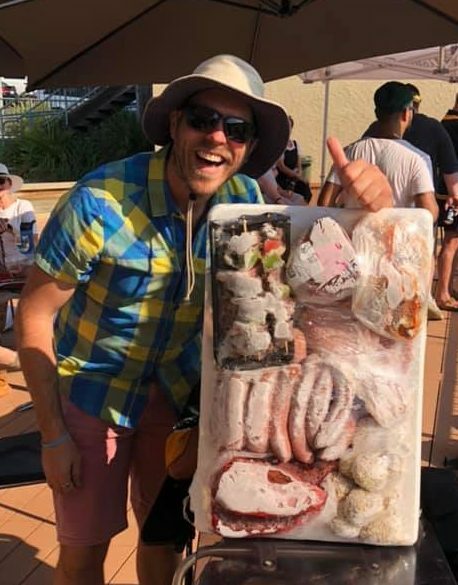 Congratulations to all the meat raffle winners. Craig Dan wining during the LOC#5 Grand Final. We will continue to work through more ideas for social events and player engagement and welcome ideas from you all for 2019/2020.